Hmmm. If you knew the flower we call a rose was called a ‘skunk blossom’, would you really perceive its scent as piercingly sweet, as redolent and seductive, as achingly nostalgic? Frankly, I doubt it. It’s why companies spend millions of dollars on getting names of brands right. It’s why people who are about to have a baby spend hours – no, days! 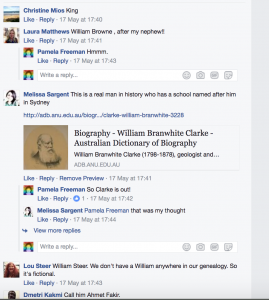 – online, looking at the baby name sites. The people who have the most trouble with this are teachers and ex-teachers – no matter what name they think of, they can remember some horrible child they taught. (I know this because all of my siblings are teachers, and I can remember the agonies they went through trying to name their children). And this is the problem which faces novelists every day: what do we call our characters? Not only do we have to have a name which we and our readers will feel comfortable reading (too long names are out, outlandish names are out unless they have some part to play in the plot, anems of famous people are out), but we need a name which fits our character. Sometimes, it’s easy. I knew from the very beginning of even thinking about The War Bride that my main character’s name was Margaret. Why? Because what happens to her was based on a real person, and her name was Margaret. Easy-peasy. And the last name for my main character in A Letter from Italy was easy, because I knew she was the daughter-in-law of a character from The War Bride, Valentine Quinn. So she was Mrs Quinn (Senora Quinn, in Italy). In contrast, her first name went through several changes. Originally she was ‘Edwina’, but that didn’t quite work – the character had a very modern outlook, thanks to a suffragette mother, and Edwina seemed a bit too old-fashioned for her mother to have chosen. Then I tried Alexis, which was a nod to my sister, Janet Alexis. But that seemed too modern. The book, after all, was set in 1917. The name needed to be timeless. When you want timeless names, you can’t beat the Bible. So I looked at Biblical names. Elizabeth (my niece Liz thought not), Anne (very common at the time, in both senses: Annie was a lower-class name, and my girl was definitely upper-class), Susan (not used much at the time) and, finally, Rebecca. At this point I thought I’d found my name, but I stopped and wondered. My publisher is Rebecca Saunders. Would she object to me snaffling her name for my character’s use? Fortunately, she was delighted, and so there my character was: Rebecca Quinn, a blonde, intelligent journalist who thought she had a happy marriage. Then I had to go through the same process for my main male character, only in Italian! Right now, I’m trying to tie down the surname of my main male character in my next book, The Desert Nurse. He has always been William in my thoughts, but his last name has varied widely, and I couldn't make up my mind. 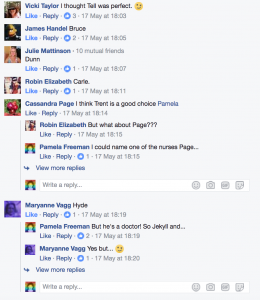 Not having millions of dollars for a focus group-led research study, I asked my Facebook friends to give me suggestions…. They came through wonderfully, but so many choices! Have a look below. At this point of the process, William’s last name is Brent. But I can’t promise you that if you read The Desert Nurse when it comes out next year that it will still be Brent. He’s gone through Boyd, Hunt, Clarke and Barton already! And I'm happy to take any of your suggestions - there's still time to get in before the name is set firm! 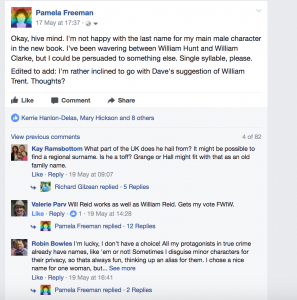 ps The keen-eyed among you will note that my name in these posts is Pamela Freeman, which is the name I write under for children's books. You're welcome to be my Facebook friend (as Pamela Freeman) or like my author page (as Pamela Hart).